The Gore Booths were resident landowners, unlike many of their peers (Lord Palmerston at nearby Classiebawn being just one example), who lived on their property, and ploughed money into improvements. The third baronet (Robert Gore Booth) began an improvement and expansion of the Lissadell estate in the late 18th century, and this work was continued by the fourth Baronet (also Robert Gore Booth), when he reached adulthood. In the 1830s Sir Robert acquired a further 875 acres in Ballygilgan (to the east of Lissadell), and he arranged a programme of assisted emigration of 52 families to Quebec in Canada from the area known locally as the seven cartrons. His assisted emigration programme took five years, from 1834 to 1839, and in 1839 he paid each person £2 a head for disturbance, £4 for every acre of good land, and sea passage in the Pomona. He had already paid ‘compensation’ of £196.58.04 to tenants for ‘giving up possession’ in 1834, and again in 1835. Eighteen families who declined to emigrate were given landholdings in Lissadell, Cloonmullen, Ballintemple, Cartonwilliamoge, Cooladrumman, Cillaghmore and Ballygilgan in Sligo. There were two reasons for the assisted emigration programme. First the rundale system operated by tenants led to the rapid growth of sub-tenants and their dependants, all subsisting on smaller tracts of land, as the system allowed continual subdivision of the holdings. The consequent congestion, and the non viability of the subdivided holdings, was recognised by some tenants, many of whom favoured the assisted emigration programme. Sir Robert told the Select Committee of the House of Lords on Colonization from Ireland in 1848 that “applications to emigrate considerably exceeded the places I had available”. “..one of the first landowners in pre-Famine Ireland to examine the question of poverty and congestion in Ireland and to suggest possible remedies. As early as 1823, at the age of 18, he concluded that radical changes were needed to avoid a major catastrophe [and that] consolidation of holdings into viable units was vital. Later, in 1847, he stated that ‘I have at all times endeavoured to increase the size of the [tenants’] farms and in a manner that was consistent with justice to the individual’. ….. Tenants were encouraged and assisted to drain their lands, and slates were provided for buildings, and timber for roofs, doors, door cases and windows of new houses. A plan was provided for each house.. and all tenants [were required to] whitewash their house before 1 April each year. …. Improvements were financed by a loan fund where tenants borrowed money at a favourable rate. In 1833 Gore Booth’s father-in-law, Thomas Goold, suggested that a sinking fund be established to pay for such improvements: £4,000 was made available for Lissadell. ….. In 1843 a total of 51 per cent of tenants with farms under 5 acres owed more than one year’s rent, while 16 per cent in the 5 – 15 acres category were in arrears. ……….In the 1830s [Sir Robert] built a harbour at Raghley, designed by Alexander Nimmo, to improve fishing in the area”. Dr Moran records that in an address to Sir Robert by his Carney tenants of 5th October, 1845, they stated that he had improved thier lives and allowed them “the fullest liberty of conscience, whether political or religious“. The second reason for the assisted emigration programme was that Sir Robert was expanding his demesne, continuing an expansion plan first begun by his father. By 1826 he had planted 52,100 trees within the demesne, had closed by Grand Jury Presentment an old public road on the then perimiter of the estate, and arranged through the Grand Jury the opening of a new public road further north and west (later known as County Road 347). Sir Robert also acquired a large estate in Ballymote, funding this purchase and the Ballygilgan purchase by the sale and mortgage of family property in Manchester, England. In economic terms it was a bad exchange, as land in Manchester increased hugely in value during the 1840s, whereas land in Ireland was devalued by the catastrophe of the Great Famine of 1845 – 1847. But Sir Robert was a resident landlord who cared deeply for his land, for his tenants and for his community (as he was to demonstrate), unlike many of his absentee landlord contemporaries. Lissadell itself was not mortgaged for these purchases, and it is doubtful if tradition is correct in saying that the estate was mortgaged for famine relief in the 1840s. Money was found, however, during the Great Famine years, from borrowings on Sir Robert’s English estates (as his Irish estates ‘could not have borne the cost’), and with the help of his wife Sir Robert distributed soup, bread and oatmeal to those in need in the covered Riding Arena at Lissadell. His son Henry did the same during the famine years of 1879 – 80. Sir Robert also chaired four Famine Relief Committees, working closely with the inspectors to find out the actual situation of the poor (not his own tenants) who were too destitute to seek assistance for themselves. Sir Robert himself brought the inspector into the houses of the poor, to demonstrate the absolute necessity for urgent measures to alleviate their condition. His purpose was to insist that the authorities should be made fully aware of the reality of the crisis, and the relative futility of individual efforts in the face of the catastrophic effects of mass starvation. He hoped to persuade the Government in Westminster to take a greater role in dealing with the crisis and its aftermath. However central government maintained a cool distance, leaving the administration of limited relief to the self-righteous assistant secretary to the Treasury, Charles Trevelyan, who restricted food distribution, refused to contemplate land reform to prevent the cruel policy of forced eviction of the starving by ruthless, absentee landlords, and not only insisted that ship loads of food grown in Ireland should continue to be exported as before, but provided military escorts to prevent attacks by the starving. ‘The judgment of God sent the calamity to teach the Irish a lesson, that calamity must not be too much mitigated. …The real evil with which we have to contend is not the physical evil of the Famine, but the moral evil of the selfish, perverse and turbulent character of the people’. Letter to Col. Jones, 2nd December 1846 [Trevelyan, private Letter Books, Vol X]; and see also “The Irish crisis, being a narrative of the measures for the relief of the distress caused by the Great Irish Famine of 1846–7”published by Trevelyan in London in 1880 – coincidentally the second year of another Famine in the West of Ireland. In a letter to Thomas Spring-Rice during the Famine he declared that: “It forms no part of the functions of government to provide supplies of food …I hope I am not guilty of irreverence in thinking that, this being altogether beyond the power of man, the cure has been applied by the direct stroke of an all-wise Providence in a manner as unexpected and unthought as it is likely to be effectual. God grant that we may rightly perform our part, and not turn into a curse what was intended for a blessing”. C. E. Trevelyan. Treasury, 9 October 1846. “Kincaid recommending me to Thin the Population on the Townlands of which the Leases have Expired …. I have .. made it my mind not to do so unjustifiable an act. If any can be persuaded to emigrate voluntarily well & good; but not a single creature shall be expelled”. 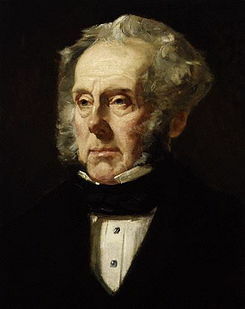 Or perhaps Palmerston agreed with Trevelyan that this Famine was a “mechanism for reducing surplus population”. He certainly looked the other way whilst an inhuman policy of “laissez-faire” or non intervention was applied. “He thinks that the destitution here is so horrible, and the indifference of the House of Commons is so manifest, that he is an unfit agent for a policy that must be one of extermination…. Twisleton feels that as Chief Commissioner he is placed in a position…which no man of honour and humanity can endure”. 12th March 1849, Clarendon Papers, Out Letter Books, Vol IV. The non interventionist laissez-faire or free trade policy applied by the British Government to Ireland was in marked contrast to the steps taken by its European neighbours to alleviate the distress of the 1845-6 potato Famine in Europe. From as early as September 1845 the Belgian authorities acted to prohibit the export of food products and stimulate imports. As a result of an active purchase policy, bread grain imports doubled and trebled in 1845-1847. In Sweden the government issued a ban on the export of potatoes in 1846 and on all sorts of grains, bread and potatoes in August 1847. Even the government of the Netherlands – “after the British, probably the one most dedicated to the ideology of open borders and undisturbed market mechanisms” – intervened to stimulate imports and to discourage exports. See: “The European subsistence crisis of 1845-1850: a comparative perspective”, IEHC 2006 Helsinki Session 123. Sir Robert Gore Booth and his wife, living and working daily with the appalling consequences of repeated famines, continued to distribute food to the destitute outside their own property, particularly at Raghley, his wife continuing this work alone when Sir Robert became ill of famine fever. Her presence was necessary to ensure fair distribution amongst the desperate. Dr Moran’s researches indicate that in November 1845 Sir Robert established a mill at Lissadell to grind diseased potatoes. The following January he “returned £150 of conacre rents according to the losses sustained by the occupiers. He also increased the number of labourers employed at Lissadell. In 1846 he paid £1,721 to local merchants for food to be distributed to the destitute, and in 1847 he spent £13,403 on famine relief”. He bought coffins for the dead, so their relatives did not have to bury them at night, without the benefit of a Mass. “Between August 1846 and July 1847 [Sir Robert] imported 2,584 tons of food at a cost of £34,822”. He also imported seeds for planting: “in the summer of 1847 he imported 261 tons of seed oats, barley and wheat at a cost of £3,941”. The Sligo Journal reported, in October 1847, that his corn & meal store at Johnsport was robbed. Sir Robert noted that “the distress in this district cannot be imagined, it must be seen, but I am happy to say very little exists on my own property or those portions over which I have control“. In the five months from December 1846 to May 1847 Sir Robert spent two thousand four hundred and twenty seven pounds, 15 shillings and 9 pence (£2,427.15.09) on famine relief for ‘labourers and their families’, the ‘poor in Ballintrillick’, and also for clothing, blankets and food for ‘Emigrants’ on the ship AEolus. Sir Robert’s programme of assisted emigration, however, came in for some scrutiny and criticism as it was swiftly followed by the Great Famine, which led to a multiplicity of forced emigration from many parts of Ireland. Allegations of forced emigration were made by his political opponents, a charge Sir Robert was keen to rebut as is clear from his evidence to the House of Lords Select Committee in 1848. His aide memoire for this hearing has been preserved in the Lissadell Papers in the Public Records Office of Northern Ireland. In this he noted that “eighteen families got farms on my estate elsewhere and many others were offered land at Ballintrillick but preferred going to America. He paid £273 ‘for passage money to America’ in 1839, and £148 in 1841. Later, during the famine, he paid thousands of pounds to provision the ships, and provide clothing and blankets. “I think usually they are very willing to emigrate when absolutely obliged to quit the land; but they have a very strong affection for the ground they have resided upon, and would, in many instances, prefer existing upon it to getting rich elsewhere. They are an uncertain people; they sometimes take a dislike to move, but when forced to do so by circumstances they preferred emigration to the holding an indifferent farm which required much labour. Q: Was it in fact a voluntary emigration, undertaken with the goodwill of the people themselves, or was it in any respect a compulsory emigration ? “Robert Newcomen Gore Booth, late of Her Majesty’s 4th Light Dragoons, and of Lissadell, Co Sligo, Ireland, aged 30 years, died in the Island of Madeira on the 29th day of October 1861, & was buried on the 31st day of the same month by me, J. Ind. Smith, Acting British Chaplain”. Sir Robert was noted, in O Rourke’s History of Sligo, to be “..a Landlord who must be classed with the best; for he let his lands at their value and never pressed for rent… always allowing his tenants plenty of time to wait for, and sell in, the best market”. Two thousand six hundred acres of the Lissadell Demesne were sold to the Land Commission in 1968, and during the 1970s this land was acquired in the main by former tenants and/or workers of the Lissadell Estate. There were two general elections in 1927, the first on 09 June 1927 and the second on 15 September. Constance Markievicz campaigned in the first (and was herself elected). She died within weeks (15 July 1927) in Sir Patrick Dun’s hospital in Dublin of complications from appendicitis. Mr Gilbride was first elected to the Dail in 1948, and served as a councillor between 1925 and 1972. Dr Moran’s conclusion was that: “Throughout the Famine years [Sir Robert] Gore Booth had only one aim: to save the people from starvation… not only was Sir Robert prepared to mortgage his lands to help in the relief of distress, he also worked in a practical way to help the people of the region. He accompanied government officials, journalists and others to those villages were destitution and famane were rampant, in the hope tha they might be able to secure additional aid for the poor. … He realised that the crisis could not be contained by individual effort. Government aid was needed..”. “He is a resident landed proprietor; he spends a large portion of his income at home; the tradesman, the artisan, and the shopkeeper are benefited by him; he is a politician of moderate views.. he has done much good during the years of famine .. He did not desert his post, but stood by the people… his kindness to the poor, in the hour of difficulty, will not be forgotten, if the hour should come to make it known”. Sir, With respect to the enclosed extracts of the Government Emigration Agent at Saint Johns New Brunswick relative to the condition & class of emigrants stated to have been sent out from your estate in the course of the past season. The commissioners of Colonial Lands and Emigration have thought that you would very probably desire to see these statements & I am therefore directed to forward them to you, & to say that should you wish to offer any remarks upon them, the Commissioners will be very happy to receive them. — I have the honor to be Sir, Your obedient Servant, S. Walcott , Secretary. 1. About one-third of those who have arrived have re-emigrated to the United States. A large number of those who remain have become a public charge, from their inability to work, and utter destitution. Among those at present chargeable are many of the emigrants by the Æolus, from Sligo. The passengers by this vessel, 500 in number, state that they were ‘exported’ by their landlord, Sir Robert Gore Booth, who paid their passage-money in order to disencumber his estate. Several of these people will, in all probability become a permanent charge on the public funds; and this shovelling of helpless paupers, without any provision for them here, if continued, will inflict very serious injury on a this colony. This case of the passengers by the Æolus is mentioned, as it will necessarily come under consideration hereafter, and should, without delay, be noticed and condemned. 2. I have to report the arrival of the barque Yeoman from Sligo, 514 passengers, and brig Alice from Galway, 125 passengers, and enclose ship returns, to which I refer. The whole of the passengers by the Yeoman were tenants on the estate of Sir Robert Gore Booth, Bart., at Lissidell, near Sligo, and are sent out at his individual expense, they having yielded up their several holdings on his estate as a consideration for their passage and expenses. They were amply provided with provisions of the best description, in every variety for the voyage, and no pains have been spared to render them comfortable. They are to receive a week’s allowance of provisions on landing, after which they must shift for themselves. These passengers appear somewhat superior to those which came from the same estate by the Æolus, a large proportion of whom are now a public charge. I examined the passengers by theYeoman very strictly, and informed them that all those who could not or would not provide for themselves, would in all probability be sent back again to Sligo. The master of the Yeoman informs me that the ship Lady Sale, may be expected in a few days from Sligo, with another 500 from Sir Robert Gore Booth’s estate; and I therefore reserve certain observations I am desirous of making until after the arrival of the Lady Sale. 3. In the Lady Sale three deaths occurred on the voyage, and 15 persons are sick on board. The passengers by theLady Sale are from the estate of Robert Gore Boothe, Bart., and are reported to be of a worse class than those which have arrived by the Æolus and Yeoman from the same estate. Many of them will become a public burthen from the moment of their landing. 4. The passengers by the ship Lady Sale are tenantry from the estate of Sir Robert Gore Boothe, and sent out at his expense. No less than 176 adult females embarked in the Lady Sale, of whom nine are widows, with 57 children. Judging from the samples of Sir Robert Gore Boothe’s tenantry which have already arrived here, another infliction of paupers may be expected in this instance, with a large proportion of widows and orphans. “We, the Committee of the Passengers of the Ship Æolus of Greendock. Capt. Michael Driscoll, Commander, do send our thanks in the name of all the Passengers, to our ever to be remembered late Landlord, Sir Robert Gore Booth, Bart., Sligo: he was always kind to his tenants. It was not tyranny which forced us to emigrate – it was the loss of our crops for two years past; and we hope to gain a living in America by strict industry and sobriety. We are thankful to Henry Gore Booth Esqr. the owner of the Æolus for the ample stores put on board for the voyage and the good quality thereof. We are also thankful to Captain Driscoll for his upright conduct in the distribution of diet – giving all the same fair play :’ – the widows and orphans and the sick were all kindly treated by him, and his advice to all had a good effect as there was not a single riot or a blow struck during the voyage. Written by Mathias Ferguson, Head Manager. Sanctioned by the Committee [listed individually]. St. John, May 31 1845″. Sir Robert Gore Booth Bart., Lessdel. Noble Sir, St. John’s, New Brunswick, Jun 13th. I am happy to inform you that I Got Clear of My passengers, In Souch a Manner as will giv you pleasure whin you hear all the particulars Connected with the Voyage. Sir Your Kind acts at hoam to privint famine and to Elivate the Condition of the Poor is as well knowen here as in the Town of Sligow, Your Ever Thankful Tennants were Highley Respected on being landed in this Town the Mayor Town Counsel &c, provided thim with large House attached to the Publick Buildings where the were lodged and Kindley threated by the Community in General Every one Vying how could, Show thim the most Kindness. I Sent them 28 lbs. Meal flour Bread & c. to the lodgeing and will continue to furnish thim while I Remain in Port the are Scattering fast I got all the Girls Leady Booth gave in My Charge good and Respectable Mrs. where the will be Kindley threathed. all the Cabin Passengers are provided for, and the Rest are geting Good Employment Verry fast, The Honourable John Robertson Mr. Henery’s Agent has taken a Verry active part, in providing for thim, and I Should hoap that before the End of June the will be all Cumfortable, there Conduct throug out the Voyage and there Soabriety after landing has Given Mee Much pleasure The Governor was in Town whin wee arrived and the Health Officers Reaport to the Governor was that Sir Robert’s Passengers or Tennants could not be classed as Common advintururs, or Emigrants, or his Brothers Ship Classed among the dirty old Emigrant hired Vessels, as the Cleaness of the Ship the Style of order Kept up the Health and Cleaness of the Passengers, the Good Diet, the Superior Medicine and the Supplying of Clean Bead Cloaths The pure Ventilation all combineed to Make her Superior to Any of her Magesty’s Thransports. I Conclude Noble Sir with My best wishes to Sir Robert, and his perfect Irish Leady and remain your deavoteted and Most Humble Servant &c. &c. &c. &c. &c. &c.
Dear Sir, Saint John, 29th June 1847. Honoured Sir, St. Johns N B. June 5th 1847. We beg leave to inform your honour that we have arrived on the 31st of many Inst. after five weeks passage all in good health with the Ecceptions of a few which was removed to hospital we intered twenty-six on our passage who was weak and destitute before we left home on the Evening of the 25th of April we had a dreadful storm the Sea washing fore and aft we had to close the hatches and nail them down and all passengers on board Eccepted a watery Grave our Captain paid very good attention during the voyage and particularry during the Storm which Continued for four days the passengers are thankful to their Captain for the distributation of provissions giving all the same Justice, the widows orphans and sick were kindly treated our Captains advice to his passengers had a good effect there was not a single riot or a stroke struck during the voyage. The passengers are thankful to Henry Gore Booth Esq. for the good Store of provissions and good quality put on board the Ship Æolus of Greenock. Edw. Jhonston. Robt. Grey. Patrick Gillou. Hugh Crystal. Patt Hart. Denis Gilloon. Charles Jones. John McLovney. Thomas Gillin. Patt McLoughlin. Andy Gilloon. Adam Johnston. James Munns. Bryan Feeney. Patt Feeney. Patt Boyle. Michl Smith. Thomas Reelly. Wm Ferguson. Wm Johnston. Owen John. Patt Havaghty. John Gillian. Dear Son March 17th 1848. New York January 22th 1848. Dear Pearants i take the opportunity of of writhing to you to let you know that i am in good health at present thank god for his kind blessings hoping that these few lines will find you in the same i live with John Warren Since i come to this country i have not seen my cousson this four months she is out in the Country i wish you to write an answer as soon as this letter arrives with you and let me know what has Occurred since i left there edward Quin sister is in this City i wish to know how the Land Lord is i wish my mother to return Lady Gore my kind compliments for her kindness to me i hope with Gods Assistance in a short time i will be able to assist my father when I get aquaint with the Country My Cousson Edward Quin and family is well and was a verry good friend of mine Mrs. Warren was as good as a mother to me since I Come to this Country Mr. Warren done as much for since i come to this Country as if i was his own Child My Coussons and i did not part since we left home we can see each other every Sunday in Mr. Quins house James MClean is no more i wish you to let me know how you and Mr. Walters is getting along Give my love to Maraget and Ann and Mary i wish you to keep them at scholl if you possible Give my best respects to all friends and inquiring neighbours i dont wish you to part your property for some time to i send you more account i am verry glad for leaving there and coming to this Country this is the best County Ann sends her kind love to Mrs. Hart i wish you to let me know how provisions is in that Country We had give weeks passage This is the best Country in the world is it easy making money in this Country but hard to save it We can no more at present but remain your affectionate Daughter to Death, Direct your letter to Mr. John Warren 6th Ward Hotell Corner of Centre and Duane Streets. My dear Sir, St. John’s N.B., 27th August 1847. Your having kindly expressed a wish that I should communicate how we proceeded on this Voyage I do so with pleasure to say it has pleased the Lord to have given us no Storm to encounter but I regret to say toward the closing of it we have had Fever to contend with; by the unremitted attention paid by the captain but one man fell a victim to it out of about fifty cases, ten of which were very bad, also we lost an old woman and a child, but their deaths I think were caused by general debility. On our arrival here on the evening of the 19th of August Fever was still hanging about us, next morning when the Doctor came on Board to inspect the Ship he found many labouring under it and had three and twenty landed o the Island out of which one was dead next morning, and since then up to Tuesday the 24th inst. about the same number has been landed, some of them to take charge of their friends, and four children having died on board, the Captain and the Commissioner of Emigration seemed to think it better to land all as they dreaded it would cause a greater uproar to bring them up to the city particularly after the tax the passengers of the former ship has imposed on the citizens, but I have no doubt that the passengers brought by this ship will quite redeem their characters for they are admitted by all who yet seen them to be of a very superior class, and indeed I must say their appearance have been much improved by the exertion of the Captain and Mrs. Purdon whose attention throughout the Voyage to all was beyond anything I could have imagined and for theirs to me I cannot ever forget. The Captain deeming it advisable hired a Steamer to take all the passengers that were well to town yesterday many of whom have already obtained employment. Young Gillmor has succeeded in obtaining employment as farming servant to Doctor Petters at Twenty Pounds per Annum with his boarding, and his sisters an old Lady has taken charge off until she can procure them some suitable employment. Mr. Robertson understanding that there is a great demand for Labourers in Digby and Fredericktown have made arrangements to transmit some of them by the steamer tomorrow. I have handed him your kind letter of introduction and he seems to hope to be able to procure me employment in a few days, indeed I am much pleased with the reception I have met with from all to whom I have as yet been introduced, as also the appearance of the Town which far exceeded what I expected, it has about thirty thousand inhabitants, some of the shops are very large, most of the buildings are made of wood notwithstanding the greater part of the country around the Town is one mass of Rock. I had letters written to forward home by the first Vessel we might meet passing but we were not fortunate enough to meet any and now as i have many letters to write to forward by the post which starts tomorrow and besides I am aware the captain is about forwarding a detailed journal of how we proceeded on the Voyage I beg you will excuse my not writing more fully now but shall take advantage of the first opportunity to do so. St.John N.B. November 22d 1847. Weare all highered in the one house As soon as you receive this letter wright as soon as possible and Direct it to Mr. George Ball of Misspeek Mills Parish of Simons Province of St.John British North America. St. Johns New Brunswick November the 17th 1847. Dear mother and brother I take the favourable opportunity of writting these few lines to you hoping to find you are all in as good health as this laves me and my sister at present thanks be God for all his mercies to us Dear mother we were very uneasy for ever coming to this country for we were in a bad State of health During The Voiage their was a very bad fever aboard Pebby was taken to the Cabbin by the Captains wife and was there from we were a week on Sea till we came to quarentine and took the fever on the Ship then all the passengers that did not pass the Doctor was sent to the Isleand and She was kept by the Captains wife then on laving the ship. Pebby was relapsed again and sent to Hospital and remained their nine or ten days but thanks be to God we got over all the Disorders belonging the Ship I was at work at A Dollar per day But the place got very bad and no regard for new passengers even a nights Lodgeing could be easy found I met with Andy Kerrigan and he took me with him to his house and remained their for amounth Boarding Mary took a very Bad fever and was Despaired of Both by priest and Doctor And as soon as She got well Andy took the Same disease I am Sorry to relate that poor Biddy Claney And Catharine McGowan Died in Hospital and A great many of our friends their is Aprospect of the winter Been very bad and I offten wished to be a home again Bad and all as we were we offten wished we never Seen St. John Dear Mother I hope you will Let me now as soon as possible how are you all my Sisters and poor Brother and all in good health it is all we are Sorry for that we cannot Send any relief to you But this place is Different to our opinions at home any new pasengers except the have friends before them are in Distress its very to get work here except them that are in Steady employment The goverment are about to Send all the passengers that were Sent out here by Lord Pamistown and Sir Robert Home again Because the the are sure that all of them that did not perish that the surely will this Winter Dear mother let us now how ye are getting on or are you all in good health I am very glad that Catharine did not come to this place for a great deal of our neighbours Died here I am Sorry to inform ye that James Connolly of Glaniff and wife Died and three children Thady Freely Died in hospital and Daniel Gallangher and wife of Coolagrapy and Roger McGowan of Drinaghan Patt Giblin and his Brother Domnick and I was very when I herd that Thady Giblin Died Let us now how is Mr. and Misses Likely and not Forgetting Baby Pebby Sends her love and Best respects them Let us now how is our neighbours Dan McGowan and Patt Connolly and family and also Patt Quin Let us now how is Honor Flanigan I am sorry to teel that a great deal of our Comrad passengers did in Hospital Mick Waters of Grange Died and James Gilmartin of Newtown We have a right To Return God thanks for his Mercy to us Let us now how does the markets Rate or is the publick works in force or any relief given Since we left that Country or is Fill or Mary in Service Thanks be to God I was not one hour Since I came to this Country but Pebby was a long time comeing round which gave me great trouble and uneasiness Bridget Conoly was given up and was in the quarentien Isleand Six weeks and her child Died in the Isleand A great many of the passengers went out to the country and could get no employ Bad as the City is it is better than the Country We expect to Spend the Winter here Patt McGowan and his wife and us is together and his wife works for the Shops at 2l. 5s. Amth The day I rote this Letter Peby got good Service at two Dollars A mounth if God Spares we we Soon be able to send some help to you and if either Boy or Girl had Had Any Sort of good Service it would Be Better than Here No more at present But remains your Loving and affectionate BRYAN CLANCY AND SISTER. Brother Answer this as Soon as possible. An ugly story surfaced in later years – that the ship Pomona sank in Sligo Bay with scores of Sir Robert’s unfortunate tenants. This claim was investigated by Trevor Reeves Smith in 1998, and dismissed as fiction. The Pomona, according to Lloyds List, sailed from Raghly on 31st May, arrived safely in Canada on 6th June, and returned again to Ireland arriving at Kingstown (Dunlaoghaire) on 29th August and sailed from Dublin for Sierra Leone on the 19th October: “Anne Marreco, one of the biographers of Sir Robert’s grand-daughter, Constance Markievicz, the Rebel Countess, investigated the story and could not find any supporting reports in contemporary newspapers and found, in contrast, frequent reports of the generosity of Sir Robert towards his tenants. What may have happened is that Sir Robert’s ship was confused with an emigrant ship of the same name which sank off Carnsore Point, Co. Wexford, ten years later, and with which Sir Robert had no connection whatever. The story of Sir Robert’s ‘rotten ship’ is not contemporary and in fact dates from the late 1850s”. Lissadell Papers, PRONI. POMONA (1859): Clipper, owner unknown, 1500 tons, sailed from Liverpool for America on Wednesday, April 27th,1859. There were onboard Captain Charles Merrihew, 33 sailors, 2 Mates, a doctor, 2 Stewards and a carpenter. There were also 372 emigrants to give a total of 412 souls. That night, a freshening gale blew up and the Captain lost his bearings in the darkness. The ship went aground on a sandbank [known as the Blackwater Bank] about seven miles off Ballyconigar [Co. Wexford] on the Irish coast. During the night, and into the next morning, the wind increased to hurricane force and a desperate attempt was made to launch the ship’s boats but they were stove-in and their crews drowned. The ship had remained firmly embedded on the sandbank until the afternoon of April 28th when she suddenly slipped off and slid, stern-first, into deeper water and began to rapidly fill. The whaler was then launched and a number of the crew rushed into her, of which several were washed out and drowned with 23 reaching the shore. The Captain let go the bower anchor and kept 40 men working at the pumps but she gradually settled down and gradually submerged. Over the next 48 hours, scores of bodies began to be washed-up on the coast and it was reported that local inhabitants stripped these of their clothing and valuables until the Coastguard arrived and took control of the situation. The 3rd Mate was the only survivor from the officers and his testimony offered no explanation for the disaster. Philip Mulcahey, the passengers’ cook from Waterford, survived the disaster and deposed that the ship’s crew gave no thought to saving the lives of the passengers. At a Coroner’s inquest the report was made that there was no proof of the Captain’s drunkenness but the members heartily condemned that portion of the crew which deserted their passengers, occupying the boats to the exclusion of the women and children. They called for a further inquiry by the Lords of Admiralty and recommended that, in future, seamen surviving the loss of a ship should be detained until due inquiry was made into the particulars of the case. In all, more than 380 persons were drowned. There was jubilation in Ballymote, part of the Gore-Booth estates, in 1879, when he announced a forty per cent reduction in the rents. The famine of 1878-80 (An Gorta Beag) left a lasting impression on Sir Robert’s grandchildren, Josslyn, Eva and Constance Gore Booth, all of whom had highly developed social consciences. Sir Josslyn was a humane and compassionate man, whose aim was to create as much local employment as he could. He worked with Horace Plunkett in creating cooperative creameries in Ballinfull, Drumcliffe and Ballintrillick; and also created a large horticultural enterprise at Lissadell, giving employment to hundreds of families. He was one of the first landlords to sell his land to his tenants under the Wyndham Land Act of 1903. The Ballymote and Rossinver Estates, comprising 28,000 acres, were sold to tenants in 1908. Payments were still being received in the 1970s. Sir Josslyn retained 3000 acres, comprising the Lissadell Demesne. Eva’s social conscience led her to join the suffragette movement, and to work with the poor in Manchester, campaigning against Winston Churchill over barmaids’ rights in 1908. Constance, Countess Markievicz, devoted her time to the poor of Dublin, as well as nationalist politics, and it was the poor who flocked in their thousands to her funeral in 1927. ‘one must utterly destroy the customs and practices’ so that ‘the next generation of Irishe must in thought and heart and every else become Englishe’. In 1567 Sligo chief Donough O’Connor was captured and taken prisoner to England by Paul Gore, an ancestor of the Gore Booth family of Lissadell. He was released on condition of submission and conformity, which he rejected on his return to Sligo. In 1584 the arrival of a huge invading force under the command of Richard Bingham forced the O’Connor Sligo into further submission. During the subsequent Cromwellian aggression in Ireland the O’Connor, who had supported rebellion, lost his land in Sligo. The main beneficiaries were Francis Gore, whose descendents lived at Lissadell, and John Temple, whose descendent Henry Temple (Lord Palmerston) built himself a country house at Classiebawn.